December is finally here. Bells and whistles, presents and joy, everything in our beautiful town is already dressed for the winter holidays, so we are looking forward to meet your acquaintance. Ambient Hotel is welcoming you this month with love and warmth in our soul. By visiting us, you will be able to celebrate this month in a unique way. On 1st of December we do not only celebrate the National Day of our country, but we also celebrate 100 years anniversary since the Great Union. So, on this occasion, we manage to organize a romanian – style party where you are all invited. Ambient Resort will be the scene of all our warm hearted partys, regardless to where you are accommodated: Christmas is dedicated to the litttle ones, where Santa will visit and bring lots of gifts ; New Year’s Eve party will enchant your souls with Romanian traditions , live music, chef’s traditional dishes and lots of joy. Now that we revealed our surprises for you, we will also reveal some of the surprises our lovely Brasov organized. On the National Day of Romania you can take part in Piața Sfatului (Council Square) at countless performances, such as traditional folcloric dances dedicated to this day, Festivity of lightning the lights of the town, concerts with Antonia and Direcția 5, fireworks and closing the night with a Gala Show that will take place at the “Sică Alexandrescu”Theater which will also be live streaming in the Council Square. On 2nd of December, the concerts will continue with Subcarpați Band and at Bran Castle will be the last night of “The Vampires Party”. Being a month full of stories and art, Brasov wouldn’t back down and will host for you differently concerts. Not only Carols Concerts, but concerts of modern music and clasical music as well with lovely artists like Fuego, Tudor Gheorghe, Damian Drăghici, Ducu Bertzi, Taxy Band and also Johann Strauss Ensemble and the National Chamber Choir “Madrigal – Marin Constantin”. 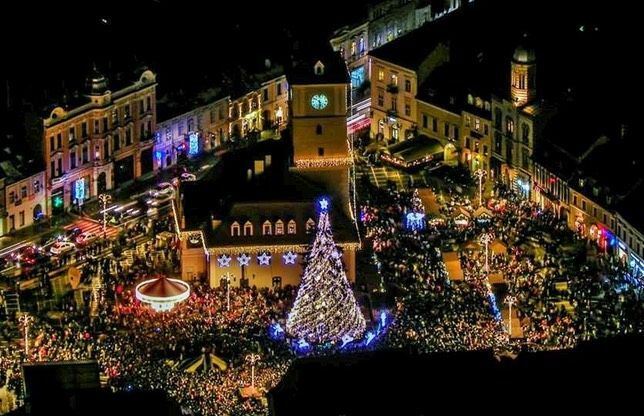 Between 14th and 16th of December, The Christmas Market will take place and on 15th of December Santa Claus is waiting for you in the Council Square, that’s only if you have been good this year. Being serious now, until 12th of December you can pass by the 4th edition of the National Exhibition “Oameni și Datini” at Reduta Cultural Center and at the Multicultural Center of Transylvania University you can find the painting exhibition “Sigma Polke” wich takes place between 6th and 12th of December. We are waiting for you with open arms to discover the rest of this month’s surprises alongside our locations and the Ambient team. Ambient - Hotel & Restaurant . Designed with special care by HOTEL'S PERFORMANCE. All Rights Reserved.